Plate almost any metal without cyanide or harsh fumes. 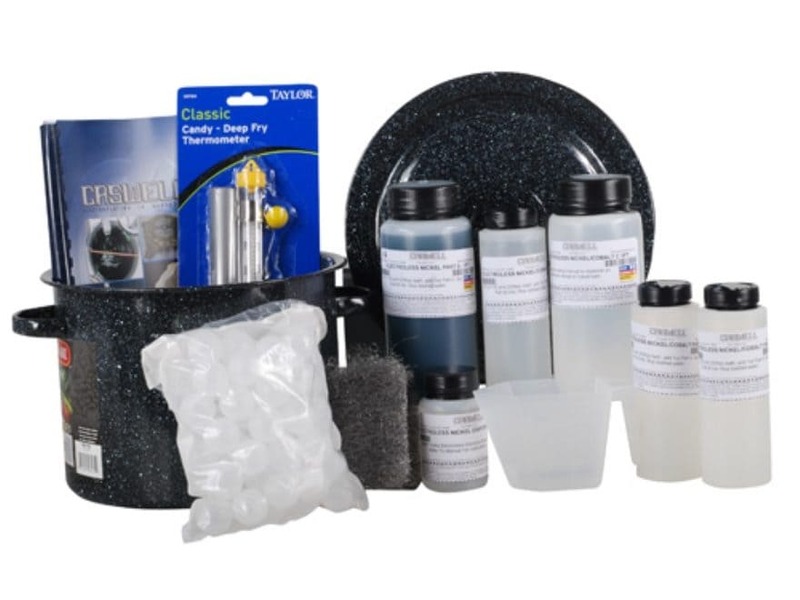 These Kits are perfect for nickel plating gun parts or other small parts for automotive or hobby applications. Everything you need to begin nickel plating is included. "Caswell Plating Manual" -- complete instructions for use. After making up the initial solution, each kit can be replenished with the included replenisher chemical, to a maximum of 10 times. After 10 times, the bath must be disposed and a fresh bath made. Based on the size of the kit, each kit will plate a certain amount of surface area. Refer to the table below. Replenishment chemicals can be purchased separately. Kit Size: Maximum Load (largest size part), Approx Total Surface Area Available @ 0.0005"
Mini: 75 sq in, 132 sq in. Standard:150 sq in., 264 sq in. WARNING: This product can expose you to Nickel compounds, which is known to the State of California to cause cancer. For more information go to - www.P65Warnings.ca.gov.